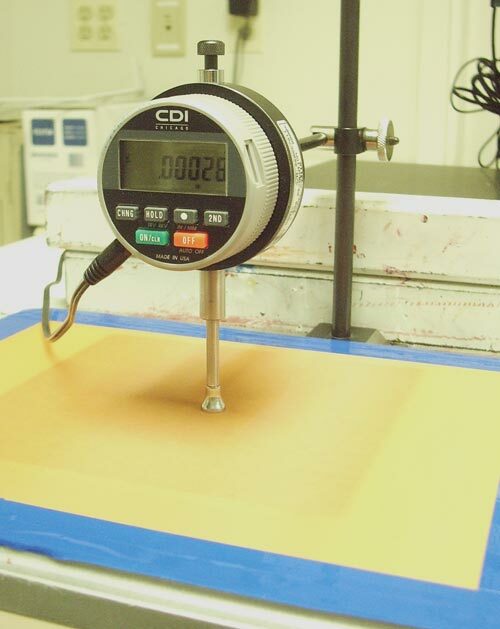 Screen Tension: This measurable item is the most critical of all screen production parameters. Screen-to-screen tension variations can change the thickness that a standardized coating regime can produce, even with automatic coating systems. Tension affects the ink's shear rate as well as flood-bar speed, squeegee speed, print speed, edge definition and ink deposit thickness. Stencil Thickness: Stencil thickness - along with thread diameter, mesh count, tension and flood-bar speed - is one of the primary methods to control ink deposit. Not only is it important for ink deposit, stencil thickness dictates surface Rz or smoothness. 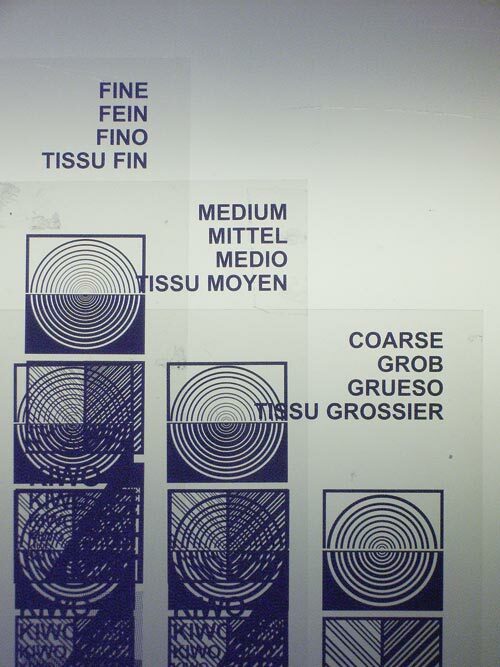 Improper stencil thickness also affects the ability of ink to be properly sheared and discharged from the screen. Stencil Surface (Rz): Rz is a measurement of the "average" smoothness (from the highest peak to the deepest valley of the screen surface at a microscopic level). You can have perfect emulsion thickness and thread count and diameter with which to deliver the correct ink deposit, but still have poor print quality because of a rough or incorrect Rz. Poor Rz equates to a poor "seal" around the perimeter of each feature in your stencil, causing ink to flow out of the image area, creating rough edges and poor resolution. 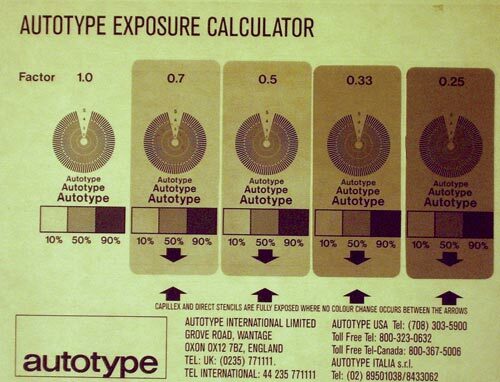 Exposure Calculation: Every change in emulsion thickness, thread color or diameter, distance from the exposure lamp or changes to film density and resolution requires a recalculation or modification to the exposure time in order to keep results consistent. 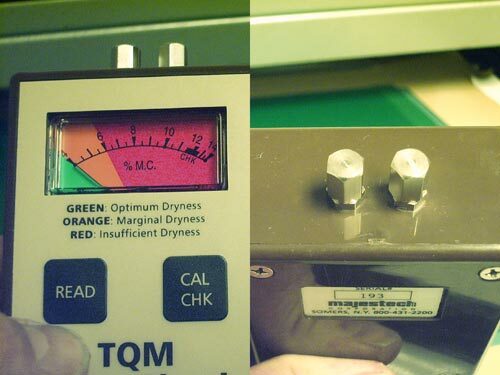 Figure 20: Two piece portable RZ gauge (top is infrared receiver, bottom is skidded probe and sender). 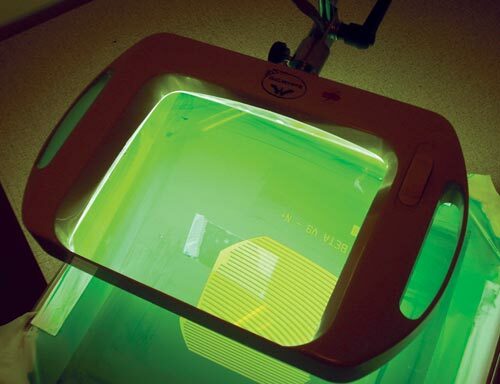 Exposure Resolution, Image and Mesh Interference and Stencil Inspection: Measuring resolution on exposed screens is one of the functions of an exposure calculation. Once the exposure for proper mechanical strength of the emulsion is established, inspection to establish proper "printable" resolution for specifying film changes requires optical tools. You may have perfect exposure and imaging of all of the features in a film, but find the features are distorted or blocked by threads. Optical inspection of screen and test-print image will determine if you will require change to film image, mesh type or stencil. Exposure Lamp Condition and Output: This is an area that is most often ignored until it has cost large amounts of time and money. Smaller shops with less advanced equipment, lacking light-to-timer integration systems, usually do not know when their lamp is providing reduced spectrum. Better equipped shops, which have light integrator systems in their exposure units, often find themselves doing work that is critical enough that variations in light quality in different areas of the exposure unit (hot spots and cool spots) can cause problems. Spot measurement of exposure lamp output is ideal for high-precision graphic and industrial printing. 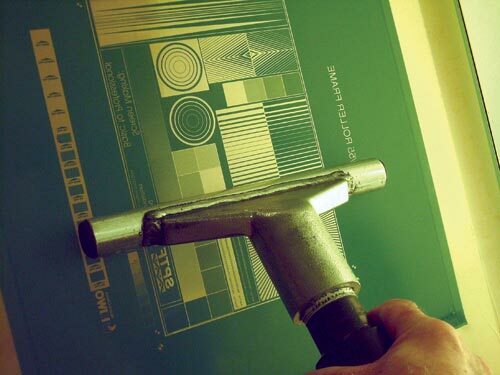 Stencil Drying Condition: Shops with fast screen turnover rates (many screens per day), shops with uncontrolled humidity and temperature as well as those with sensitive emulsion systems often have trouble properly drying emulsion before exposure. Improper drying is one of the primary reasons for poor screen life and resolution. The two main courses of action are to create spaces or cabinets and procedures that ensure proper drying (methodology), or buy instrumentation that indicates when emulsion is still too damp for exposure. Both are repeatable to about half a micron. The comparator is the simplest to use, but is the least versatile since most comparators have a short range of screen reach. The longest reach of most affordable comparators is about 45 cm (18 inches) - these are only bench-top tools. If your reach is longer than 45 cm (18 inches), it is more cost-effective to employ other, more accurate machines such as a multi-axis coordinate measuring machine. In most cases, imagers use handheld, digital magnetic induction gauges. They are portable and capable of readings anywhere on a screen at any angle. However, body vibration, temperature and humidity changes can cause enough incorrect readings that operators need some training, knowledge of what to expect and correct methodology to achieve the specified repeatability. The "skidded" probe arm type which refers to the use of a skid or guide plate that keeps the stylus tip from vibrating too hard and creating readings outside of its limits. The non-skidded probe arm type which can produce a large range of surface profile readings (e.g., Ra, Rz, Rp, RT,RV, etc.). The only readings we functionally need are the Rz readings. The non-skidded probe devices typically require three separate calibration strips: one to calibrate the arm balance, one to calibrate for the probe ball condition; and one to calibrate the linearity of the computing device. 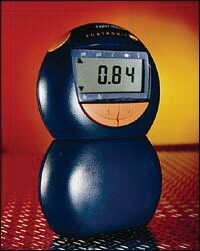 When shopping for an Rz meter for screen printing, look for a unit that has a probe ball radius of 5µ or larger. 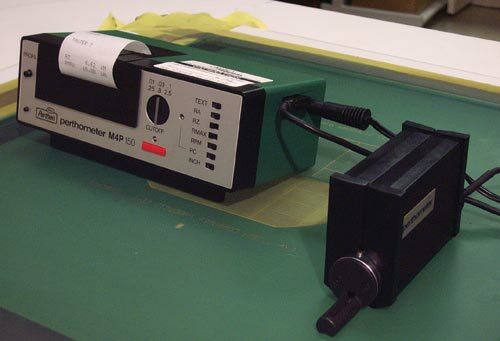 Figure 21: Bench-top perthometer and Rz meter. Figure 22: Five step exposure calculator with neutral density filters attached. The quality of the stepped-neutral density filters is the most critical part. 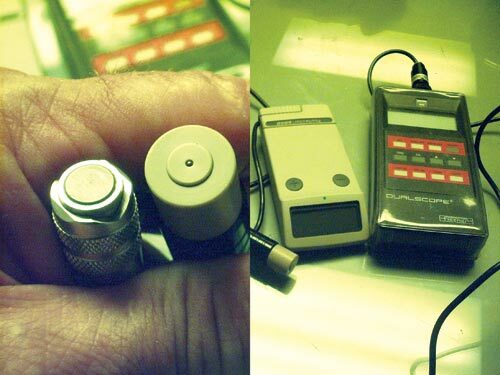 Along with a commercially made, stepped-exposure calculator, imagers should make a "step-wedge," using their own film and output devices with features that are unique to their shop. Make 10 repeat steps in the film, with space between them for overlap from the masking materials. The commercial film set guarantees you have the ability for a quick everyday check device that can be used on every screen. A careful, self-made film also can be used for fingerprinting presses and in-depth diagnostics of exposure problems. UV Radiometer: This type of radiometer is not to be confused with the UV radiometers that are sent through a UV reactor/dryer. 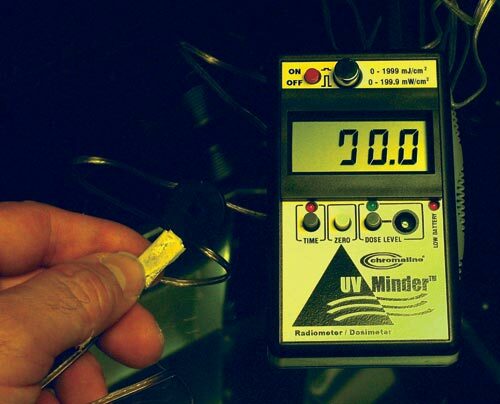 Though they measure the same wavelengths of light, exposure unit UV probes are not filtered for the extreme light intensity, joule levels and heat created by UV curing units. Radiometers for use in exposure units have a maximum energy input of approximately 1,000 W per cm2 (UV-reactor radiometers can endure lamp intensity to 5,000 W per cm2 without sensor damage). This is not an expression of their operating range. For example, if you use a fluorescent lamp unit, you may want a meter with a range between 0 and 19.99 W per cm2. For a metal halide, you may need something in the 0-199 W per cm2 range. This is not to say that these units cannot record long UV dosage (time spent in the unit), just that the actual lamp intensity should be reduced as compared with a curing unit. Figure 23: Fine, medium and coarse resolution versions of the same exposure calculator. 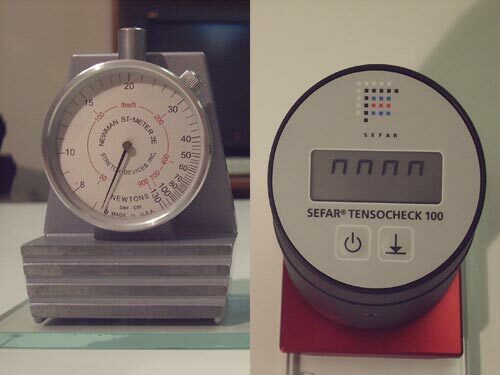 Tension Meter: There are two basic types: mechanical (See Figure 27) and digital (See Figure 28). Most have an NIST-traceable standard, but the nature of what is being measured (Newtons per centimeter) and how it is being measured means each and every meter achieves the calibrated measurement effect with its own weight. Small weight variations mean each meter will meet the National Institute for Standards and Technology (NIST or mil-spec) standards when calibrated, but may not calibrate to each other, even on the same standard. Mechanical gauges are just as accurate as digital gauges, but with fewer numerals below the decimal point in resolution. This is only a factor in the most demanding of printed circuit work and meter calibration procedures. The cost of mechanical meters is a direct reflection of their ruggedness and durability. The capacitive models can use pins or contact pads, but are more easily fooled by high-moisture surroundings in the screen room or galvanic charge differences, which can be water-borne, mineral based or ionic. A relatively accurate and more expensive system is the high-frequency galvanizing method (sometimes called dielectric constant type). It uses the galvanic charges, which are problematic with the capacitive models as a data source. Galvanic charges change as the water that connects the ions dissipates. If your screen-room humidity is not well controlled, these tools can work well in place of extreme and expensive measures to control the relative humidity in large spaces. A smaller, well-controlled emulsion drying and staging area, along with good moisture reading tools, can work wonders in trimming drying time from the process. o Ensure consistent screen tension (tension meter). Consistent screen tension can ensure a longer screen life, depending on the mesh used and stretching method. But consistent tension will ensure more consistent emulsion thickness, ink deposit and make-ready times. These in turn will standardize exposure times, print resolution and ink deposit. All of these items reduce raw material use, labor time and costly defects. 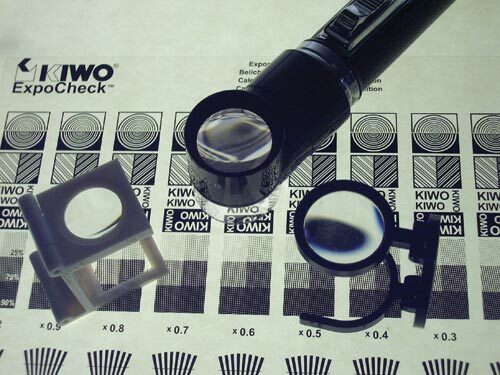 o Inspection tools (loupes, backlighting, microscopes, etc.) ensure the standard process is followed. Catching defects or errors before they leave the screen room saves wasted make-ready machine time, make-ready stock, ink and labor. Production time generally is more expensive than screen-room time (in terms of labor cost). When problems arise, the ability to pre-inspect (knowing the screens meet specification) saves troubleshooting time on press because you already know what isn't wrong. o Exposure calculators, emulsion thickness gauges and Rz meters are pure process tools. They ensure your specifications. Without knowing the emulsion thickness is correct, pre-determined exposure maps will be incorrect. The Rz meter is a tool to verify stencil uniformity in normal printing and a requirement to guarantee edge-definition and ink deposit consistency in high-tolerance printing. More to come and the wrap up in Part 4.